The company’s offer, which was presented as a package that must be accepted in its entirety, also would have made seniority one of several factors when determining which workers could be laid off, rather than the sole factor. The offer, however, did not contain previous management proposals to scale back vacation, sick leave and other benefits. 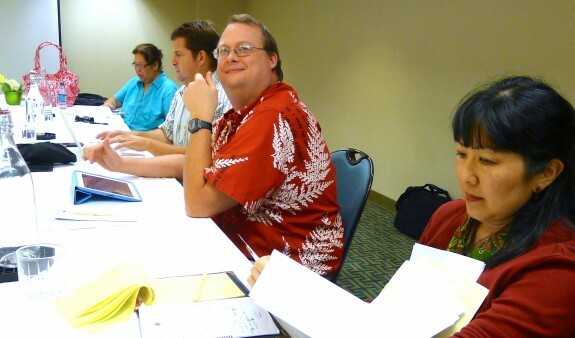 Members of the Hawaii Tribune-Herald bargaining committee caucused during talks recently in Honolulu. From left, Heather Ahue, Derrick DePledge, Colin Stewart and Alicia Tanaka. PMWG photo 2013. The guild responded with several recommendations, which included a three-year contract duration, a signing bonus, 4 percent pay raises after the first and second years, and a 90 percent to 10 percent premium split for Kaiser and an 80 to 20 percent split for HMSA. The proposed premium share was higher than the guild had previously offered. The guild has not proposed any change to seniority. The guild also continues to recommend voluntary buyouts and an enhanced severance package in exchange for the company’s right to subcontract work in the mailroom and ad production departments, which would involve layoffs. Inserting would no longer be done in Hilo. The three part-timers, according to the company, would unload completed newspapers when they arrive by truck from West Hawaii and distribute the papers to independent contractors and newspaper carriers. The three part-timers would also deliver shortages, missed or damaged papers on weekends and holidays, and down routes as needed. The two sides were unable to reach consensus on the company’s offer or the guild’s response. Representatives for the company on Thursday withdrew previous offers to include an extensive social media policy and an employee handbook in the new contract. The company also indicated that it would not agree to provide a pro-rated sick leave benefit for part-time workers or use the Internal Revenue Service standard fuel price to determine the automobile allowance, as the guild has proposed. Negotiations will likely continue in late July or early August. The existing two-year contract expired last August, but the provisions remain in effect during discussions on a new agreement.